Solar Cooling is another efficient use of renewable energy technologies to help cool our homes and work places. The necessity for air-conditioning for our homes in hot areas around the world and the abundance of the sunshine within these areas has brought about a willingness to combine the two for the benefit of the people who live there. In contrast to other types of solar applications such as solar heating, the biggest demand for cooling occurs when the solar radiation is at its most intense, thereby making the marriage of solar thermal energy and solar cooling all the more attractive. In sunny climates, it can sometimes become uncomfortably hot and as such we tend to use air conditioning to provide a cool and comfortable internal atmosphere. When we talk about space cooling, most of us think of the typical air-conditioners and refrigerators connected to an electrical power supply to cool down the air in the spaces where we live as well as for the refrigeration of our food stuffs and groceries. But modern air conditioning systems often leaves us with over dry or stale air to breath. Although electrically driven air-conditioning units have reached a relatively high standard, their energy consumption is still relatively high as most refrigeration based systems use electricity to power a compressor, so any future-oriented cooling or refrigeration based system requires a sustainable energy supply from a renewable energy source. But using solar energy to produce cooled air may seem a little bewildering at first as the sun tends to be viewed as a very large heat source rather than one we can use for cooling purposes. However, by combining solar thermal energy and modern adsorption technology, heat can be used to cool our buildings as the sun encourages thermal processes to occur producing coldness for air-conditioning purposes or by directly driving a thermal heat pump. Of course, the suns huge amount of solar radiation can also be turned into solar electricity by photovoltaic cells to provide the necessary electricity required to drive a conventional compressor based refrigeration system (active cooling). But most solar based cooling systems use photovoltaic panels to generate the electricity required to power the electronics that control the system. The principle behind solar driven refrigeration is similar to conventional refrigeration in that the cooling is produced through the evaporation of some form of liquid refrigerant that absorbs the heat and cools its surroundings. The difference here is that solar thermal energy is used instead of electrical power as the driving energy. This idea works well as the sun’s energy is abundant during the summer seasons when there is high air-conditioning demand due to the momentary increase in solar insolation and the air temperature. The advantage here is that compared to conventional cooling systems, huge electrical energy savings can be made by using solar driven adsorption chillers or by off-grid homes and buildings who supply their energy needs using a diesel generator. In these situations, cooling by utilizing solar energy would bring about a reduction in diesel fuel consumption and CO2 emissions making it beneficial to the environment. Also, no environmentally harmful substances are used to produce the coldness as pure water can be used as the refrigerant. But we need to make a distinction between solar cooling and solar air-conditioning. Generally solar cooling is the reduction in the temperature of a room, building or living space by removing the heat from it. Solar air-conditioning on the other hand, is the conditioning of a room or space in respect to its temperature and humidity properties, so that people feel comfortable within the room. Hence the term “air-conditioning”. In solar cooling systems, solar thermal heat is used as the driving force behind the cooling process. 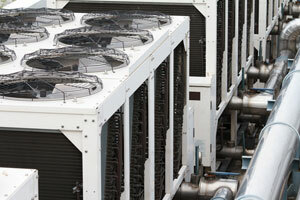 Thermally driven cooling machines, such as ab- or ad-sorption chillers have been used for many decades. Compared to designing a solar thermal domestic hot water or heating system, the planning and designing of a solar cooling system can be a little more complicated. Solar cooling and air-conditioning can be accomplished by three types of systems: open desiccant, closed absorption (WET), closed adsorption (DRY) and solar mechanical processes as outlined below. Open Cycle Solar Cooling is a desiccant system (Wet or Dry) that uses either a solid or a liquid as the refrigerant in direct contact with air. The term “open cycle” is used because the refrigerant is discarded from the system after cooling as it comes into direct contact with the air being conditioned. In this type of system, the solar thermal cooling cycle consists of evaporative cooling with an air dehumidifier by the desiccant and is why solid or liquid materials can be used. Dry or solid systems use water as a refrigerant and silica gel as a sorption material, but this material cannot be pumped or circulated in the conventional way. Instead rotary wheels are used to move the adsorbent material, such as silica gel allowing for a continuous operation. Wet or liquid based systems use Water/Lithium Bromide as their desiccant with the cooling for the absorption chiller being provided by an open wet cooling tower. Closed Cycle Solar Cooling produce chilled water that can be used in combination with any air-conditioning equipment such as an air-handling unit, fan coil systems or by pumping cold water through cooling tubes in the floors, walls or ceilings of a building, acting like a reversed heating system. In a closed cycle process, the cooling medium is not in direct contact with the environment, hence its name, but is circulated and reused around a closed pipe system. Filtered air is cooled and treated in a dehumidifier passing through several additional cooling stages before being supplied to the conditioned space. The sorbent is regenerated with ambient or exhaust air heated to the required temperature by the solar heat source. Absorption Chillers are the core of a closed cycle solar thermal cooling systems as they remove the heat from the circulating liquid either by vapour compression or through an absorption refrigeration cycle. Solar panels provide the necessary thermal energy input but its the chillers that are capable of producing the required amount of cooling by utilising the hot water coming from the solar panels. Standard flat panel solar collectors or evacuated tube collectors can be used to supply the solar thermally heated hot water to the absorption chiller. The size and choice of solar collector is determined by the operating temperature of the absorption chiller and by the and energy available from the sun in the form of solar irradiance. As well as using thermally driven chillers, another way to help cool buildings in hot sunny climates is by the use of passive solar cooling designs. Passive solar harnesses the natural flows of cooling air through open doors or windows, store the night time coolness, or automatically generate a cooling air flow by means of convection. Many buildings around the world that suffer from hot days and cool nights have taken advantage of the heat absorbing capacity of thick walls, called Trombe Walls, or other concrete structures to smooth out these extreme daily temperature variations. If additional space cooling is required, solar cooling systems can be used to smooth out the variations in solar radiation by various means such as a pond of water on a flat roof that cools via evaporation (passive cooling), or the use of solar energy to power a cooling appliance (active cooling). There are a number of different ways in which we can design our homes and buildings to stay both warm in the winter months and cool in the summer months by providing a pleasant internal temperature all year around preventing them from overheating, even in the hot summer months with solar cooling systems being classified as either passive or active designs. We have seen here that thermally driven chillers can provide chilled water for use in air-conditioning and dehumidifier units, or for distribution around a building via a closed chilled water circuit of pipes and heat exchangers to operate fan coils and air-handling units. Solar panels are used to supply the heat to drive absorption refrigeration chillers as they use a thermal compressor instead of a mechanical one. Open cycle systems generate air conditioning by supplying dehumidified and cooled air. In an open system, the refrigerant used is nearly always water, since it is in direct contact with the atmosphere. Common open cycle systems are desiccant cooling systems using a rotating dehumidification wheel with solid sorbent. Although electrically driven air-conditioning units have reached a relatively high standard in terms of their energy consumption, standard refrigeration based compressor units still require a large amount of electrical energy which can cause significant peak loads in the electrical distribution grid during spells of hot weather and as such, solar cooling systems are now becoming a serious choice in helping us to reduce our fossil fuel dependency. But today’s sorption chillers and technologies are still more expensive in comparison to conventional residential sized air-conditioning units and therefore more investment and effort is required to develop the existing technology in order to reduce unit costs and improve on annual savings. The designing of full or partial air-conditioning for buildings depends on the requirements of four separate functions: heating, cooling, humidification and dehumidification with the design of a solar cooling system being more difficult than that for a solar thermal domestic hot water supply. But the biggest obstacle of all is that the use of open cycle sorption chillers requires the existence of wet cooling towers, which are covered by specific legislation to avoid the legionnaire’s disease. The annual maintenance and control of such solar cooling installations is more expensive in the long term. For more information about “Solar Cooling”, or obtain more solar energy information about the various types of solar cooling systems available, or to just explore the advantages and disadvantages of renewable energies, then Click Here to order your copy from Amazon today about solar cooling systems and how it can be used to cool your home.